This is a blend of spices you can use in place of packaged taco seasoning–and it tastes so much better! I make this mix then put it in a small glass jar so I have it on hand when I need to spice up Mexican dishes or other things like omelettes and popcorn. Meanwhile, place quinoa and water in rice cooker and set to cook for white rice. You can also cook according to package directions on the stovetop. When quinoa is done, set aside to cool while potatoes finish cooking. Clean leek then slice lenthwise in quarters. Chop in 1/4 inch slices. 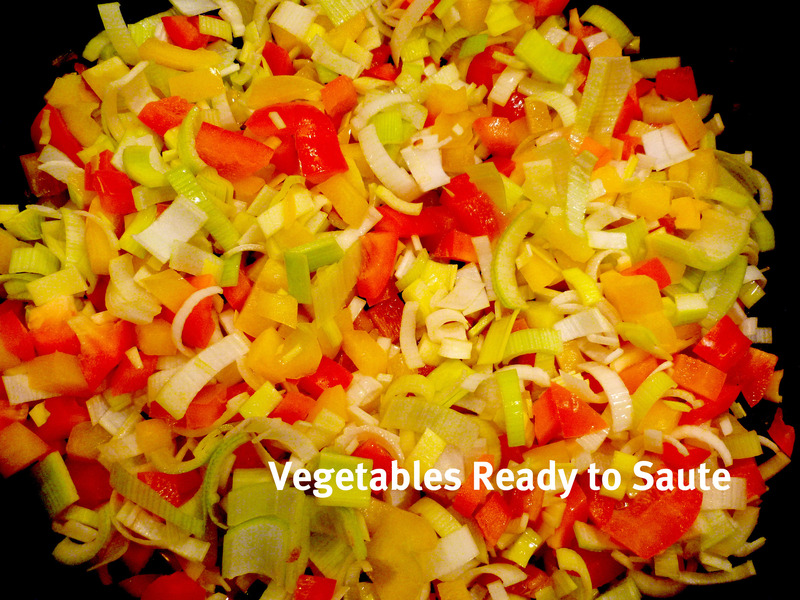 In large skillet, heat 1-2 tbsp olive oil then saute the bell peppers and leak until tender. Add 1 tsp Vogue Vegetarian Mexican Spice Mix to the saute. 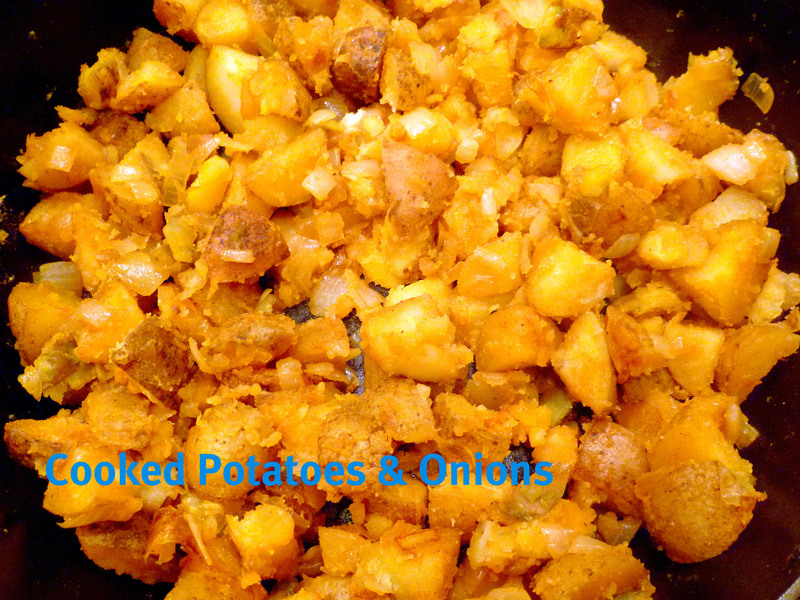 Add the sauted vegetables to the cooked potato mixture in the casserole dish you used to cook the potatoes in. Stir in an additional 1 tsp VV Mexican Spice mix and 1/2 cup of the salsa (only 1/2 cup-the other 1/2 you use later!). Mix well. 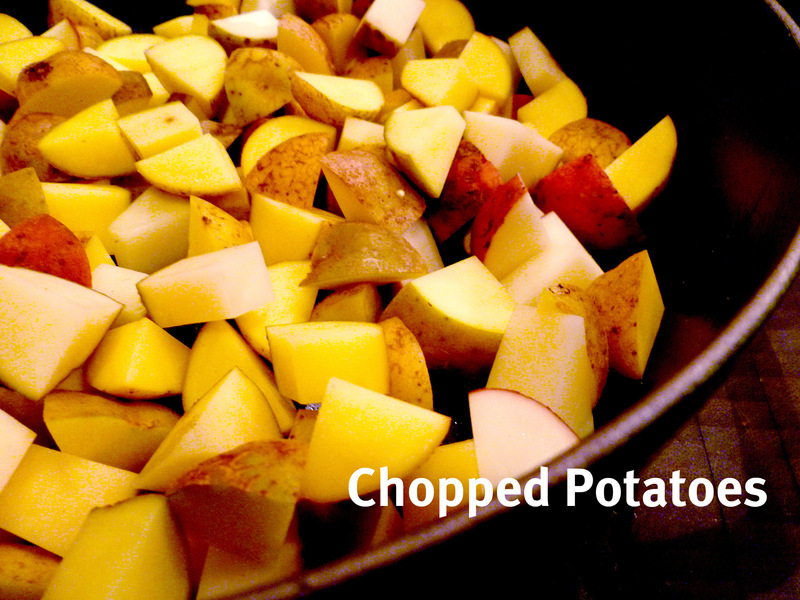 The potatoes should be soft enough that they will slighty mash as you mix. Light pat down mixture with the a large spoon or spatuala. (You don’t want to mash it, just lightly pack it down.) Sprinkle 1/2 cup of the cheese over the mixture (reserve the other 1/2 for later). 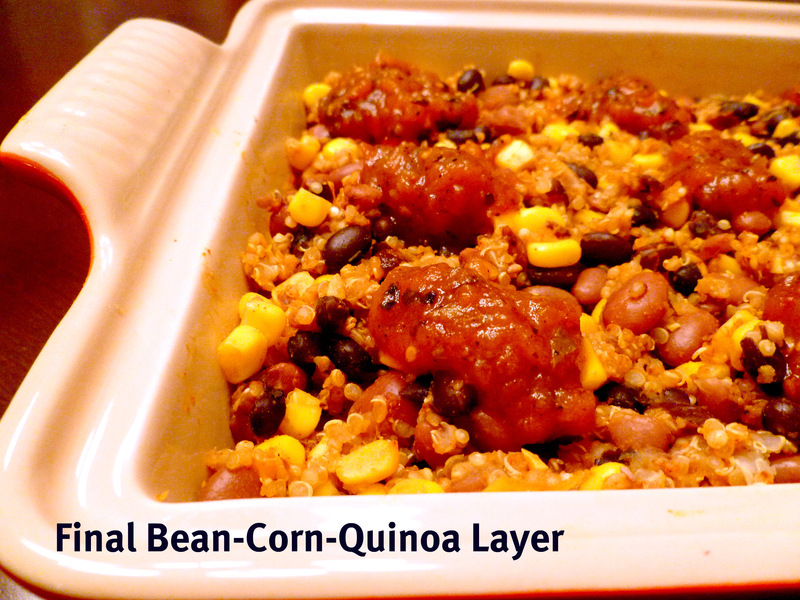 Mix the drained and rinsed beans, corn and 1 cup of the cooked quinoa together (you may have some extra quinoa left over but you can use reserve this for another time). Add in the 1 tbsp plus 1 tsp of VV Mexican Spice mix. Stir until combined. 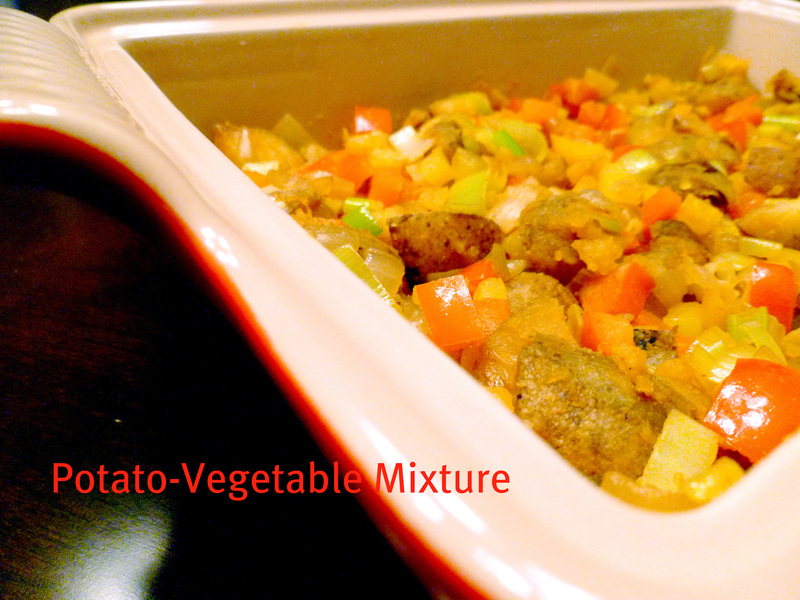 Add this mixture on top of the potato-vegetable mixture. Dallop the remaining 1/2 cup of salsa in small spoonfuls over the top. Sprinkle with the remaining 1/2 cup cheese and olives. Cover and cook at 350 for about 45 minutes. Remove lid and cook an additional 10-15 minutes or until cheese is bubbly and slighly browned to your liking. Set aside for at least 10 minutes before serving. 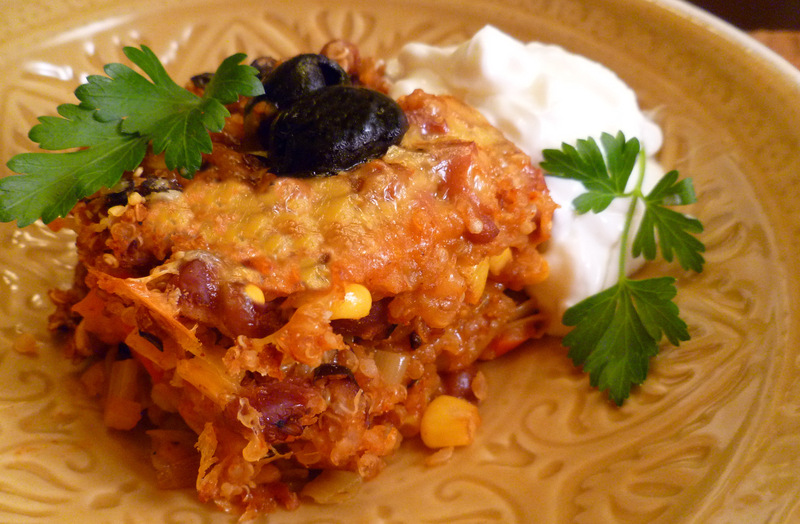 Serve with chopped cilantro, olives and sour cream. Since these items are cooked when you put them in the oven, while assembling, feel free to taste the mixture. If you feel it needs more spice mix, go for it! I have found myself putting several tablespoons in each mixture. You can also add a bit more salsa in if you’d like. You may have to cook it longer but it turns out great! 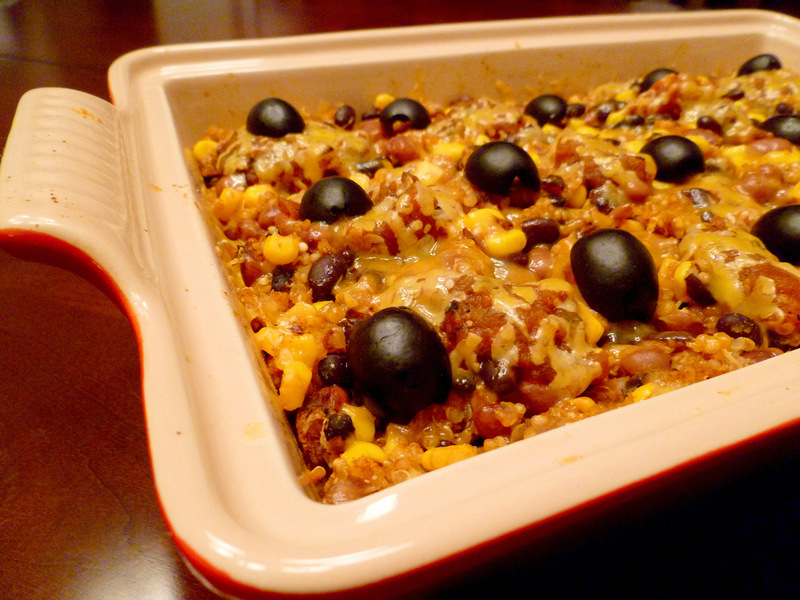 This is a perfect casserole that my family will actually eat! I hope you enjoy it! This is the dish I serve when I have non-vegetarian friends for dinner or when I have families with kids over. I haven’t found anyone that doesn’t love this dish yet. And most ask for the recipe. It’s really versatile too. Let me know how you like it. I was amazed at this filling and tasty dish. My husband, who up till now thought that all vegan food was rabbit food, absolutely loved it! He actually wanted “seconds”. He wants me to make more of your wonderful recipes. Thank you so much for taking the time to post these recipes!